I forgot to announce this before it happened, but last week on April 5th, I got to participate in a rather unique event centered on Kinugasa Teinosuke’s A Page of Madness (Kurutta ichipeiji), about which I wrote a book. 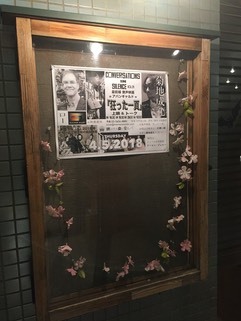 At the event space Haretara Sora ni Mame Maite (meaning “When it clears sow beans in the sky”—or Haremame for short), there was a screening of the film with Kataoka Ichiro doing benshi narration and the jazz musician Kikuchi Naruyoshi deejaying music for the film. Since Haremame is a small but delightful space (with tatami mats! ), we used the Blu-ray of the film I discussed earlier, with permission from Flicker Alley. I introduced the film and MC’d the after-screening discussion. It was the first in a series of three silent film events called “Conversations in Silence” that the three of us will be doing at Haremame. As I mentioned in the book, there is no historical record (that I could find), of the music that was performed with the film upon its first release, or of the style of benshi narration. What I could find is that it showed at the Tokyokan narrated by Ishii Masami and Tamai Kyokuyo with music selected by Oshima Kyotaro, or at Kyoto’s Shochikuza with Ishida Kyokka as the benshi and music arranged by Sasai Sei, to provide two instances. The great benshi Tokugawa Musei did perform the narration at Shinjuku’s Musashinokan, and there is a chance he did it in a style similar to his explanation of The Cabinet of Dr. Caligari (check out Kyoko Omori’s collection of clips of Caligari synched with a recording of the narration that Musei provided in 1968), since A Page of Madness was influenced by that work. 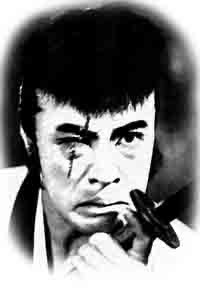 But Naoki Sanjugo (after whom the Naoki Prize is named), when noting Musashinokan audience members praising Musei for explaining that incomprehensible film, complained that it was contradictory for a film that rejected intertitles, if not also conventional meaning making, to have a benshi. So there was the question of what role sound—both words and music—was supposed to play with this supposedly avant-garde film. Historians actually don’t know that much about silent era film music in Japan. While it is clear there was a mix of Japanese and Western music, in ensembles that could combine instruments from the different traditions, there seemed to be no scores for specific film music. Luckily, Waseda’s Enpaku recently got a hold of a collection of silent era sheet music which they’ve called the Hirano Collection after the likely owner, Hirano Koichi. I got to serve as commentator for a fascinating workshop on the collection back in January. The collection shows, first, that most music was of the variety suggested with the instances of A Page of Madness I mentioned above: music that was not composed for individual films, but that music directors for individual theaters selected from widely-distributed film music compilations, attempting to match music to each scene (the collections could be arranged by the kind of emotion or action in the film). The collection also reveals early efforts by Nikkatsu to control the music for their films by distributing specific music selections for specific films. Since there is no record of Kinugasa doing that for A Page of Madness, it is likely that Oshima Kyotaro or Sasai Sei just selected music from the compilations they regularly used. So it was actually historically accurate, in a peculiar way, for Kikuchi-san to deejay the music for the film, since he too was selecting from and arranging existing music. Of course, his choices were quite different, as he used everything from Steve Reich to Arca, and even threw in a mambo song. As an admirer of Godard, he also emulated that director’s use of music by suddenly stopping and starting the music, playing with the synchronization. Since Kikuchi-san decided to up the volume of the music, and even include music with lyrics, Kataoka-san had to adjust his narration. There was no pre-performance full rehearsal, so he had to cut some of his narration, for instance, on the spot. It again showed how much a benshi performance can be improvisational, and thus a singular, one-time-only live performance of a film. Kataoka-san also toned down his explanatory statements, possibly avoiding the problem Naoki cited, while forwarding what could be called interpretive narration, as he for instance repeatedly emphasized the words “kurukuru” (round and round) both to accompany the many revolving objects in the film and to play off the Japanese word for madness (kurutta). Still, he did offer accounts of the narrative that were his own (and which might not accord with your interpretation or mine, or even the record of the film’s narrative in the censorship script contained in Kinugasa’s personal papers). Overall, it was like encountering a different A Page of Madness for the first time. As I stressed to the audience, this was a once-in-a-lifetime experience, never to be repeated again. Check out the Haremame site for news on the next two events, one in June and one in August. I’ll also announce them on Twitter.